I really enjoy working with their dies and finding new and unusual ways to use them. With these, I made a set of 3X4 Pocket Cards for pocket scrapbooking! (by Doodlebug Design) to 2.5" X 3.5" and corner rounded the edges as well. the card with either foam adhesive or used the Xyron 1" Sticker Maker. and the cards are all ready for journaling and filling pages! 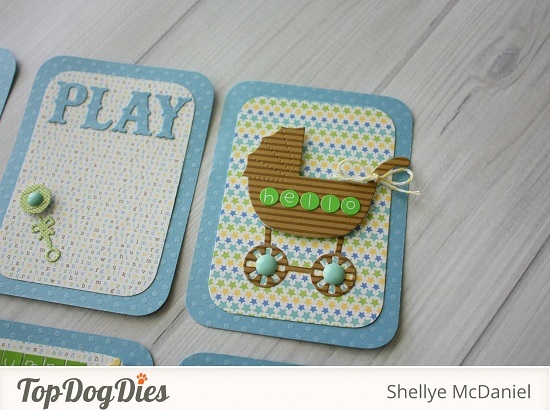 Way to go - these are adorable pocket page pieces!! Thanks for showing us how!! I don't know how I missed this...congratulations on re-joining the Design Team and I plan to make these identical 3 x 4 cards myself! LOVE them!